I love Modern Masters and give them credit for these amazing planters. They sent me paint for free in exchange for this post. I thanked them with SO much whipped cream and cherries on top. 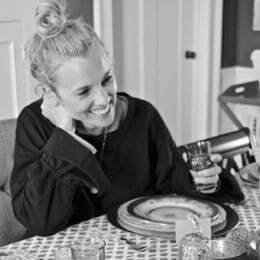 Almost five years ago we bought our first house out here in the suburbs. Six months after that, we had built our first patio. 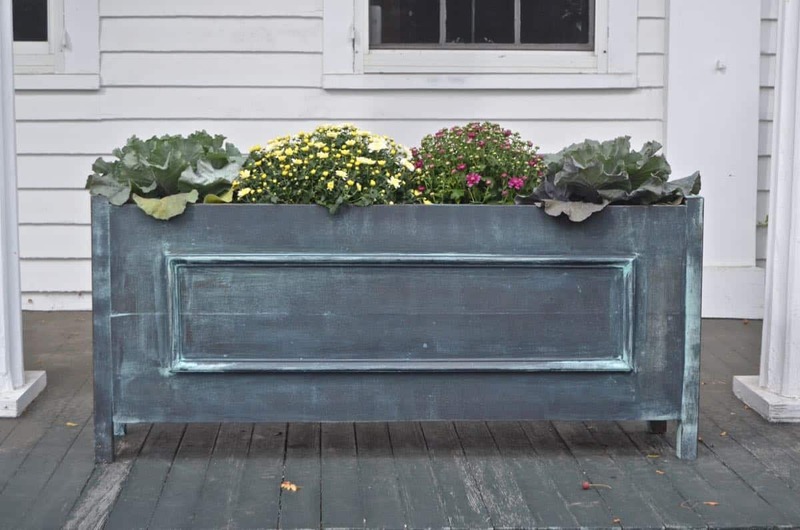 And I wanted a zinc planter baaaaaad. 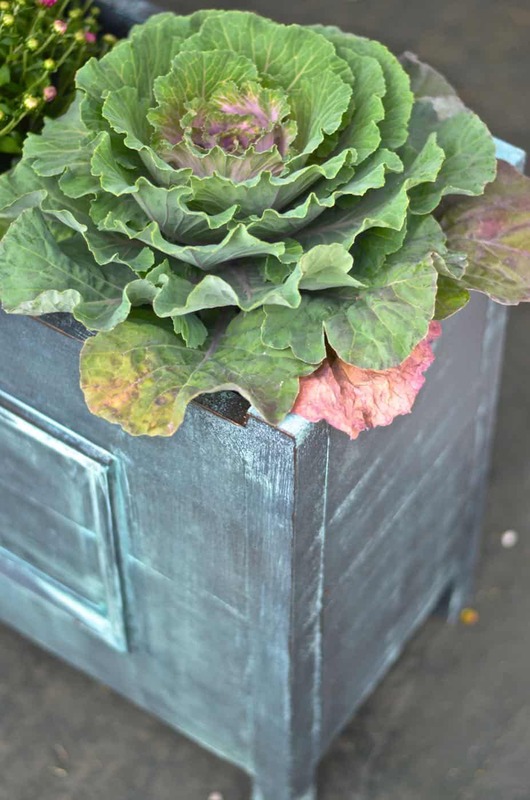 But they were expensive and the patio was a little small and I gave up on my zinc planter dream. 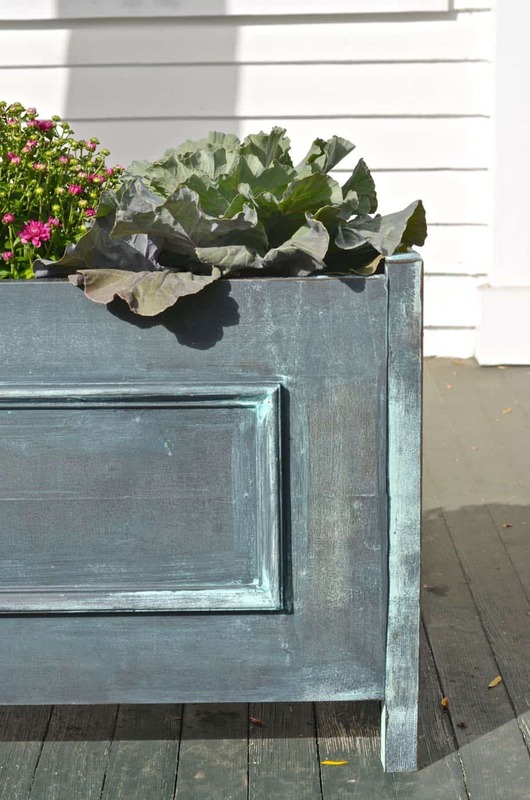 I can’t say that we moved because of our lack of zinc planters, but… maybe. Subconsciously. 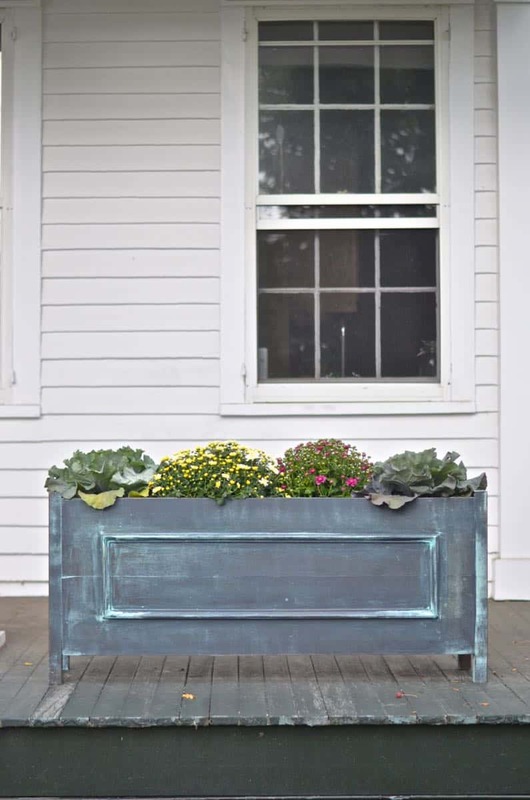 Sadly, zinc planters have not gotten any cheaper in the last 5 years. I know… weird. But thanks to Modern Masters metal effects reactive paint… faux zinc in the house. SEE HOW I MADE THESE PLANTERS HERE. I will say this much about these guys… the KEY is in the reactive paint. 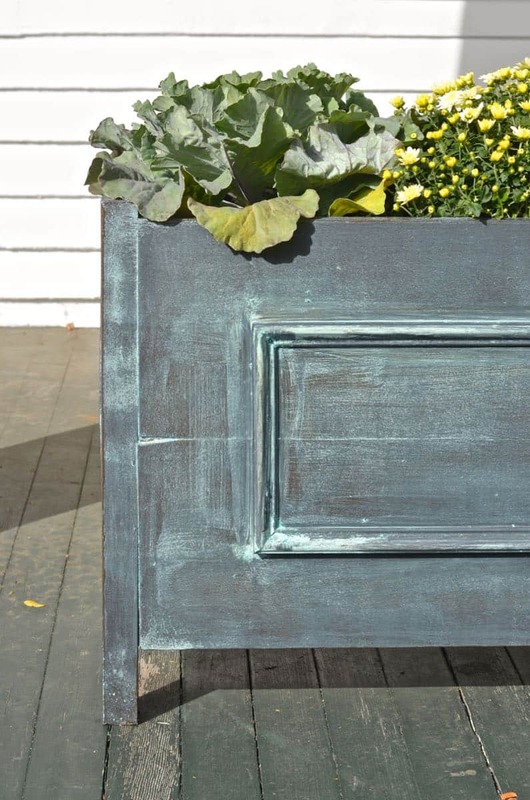 I love the look of the bronze paint with the blue patina… it’s like a weathered irony zinc loveliness. For our front porch, I wanted something large enough to anchor the space but not so large that it took up tooo much surface area. 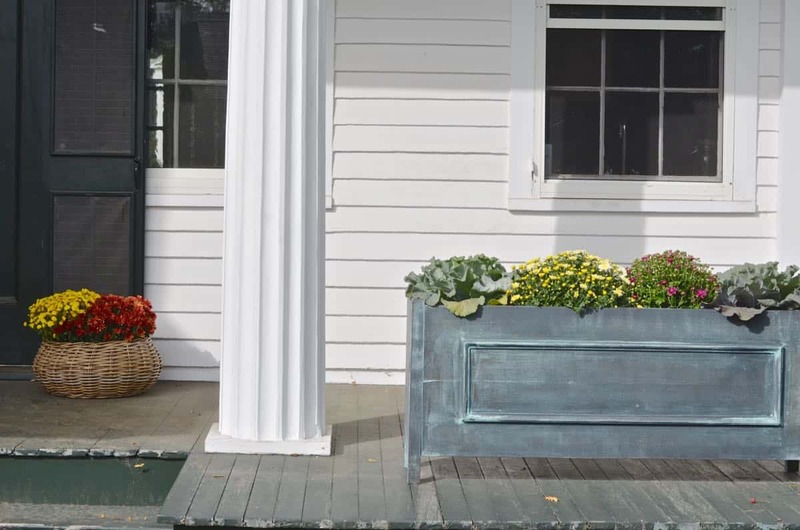 These are long and lean so they provide a nice barrier to the edge of the porch but are tall enough to stand out when looking at the porch from the street. I added a false bottom so it’s not as deep as it looks. 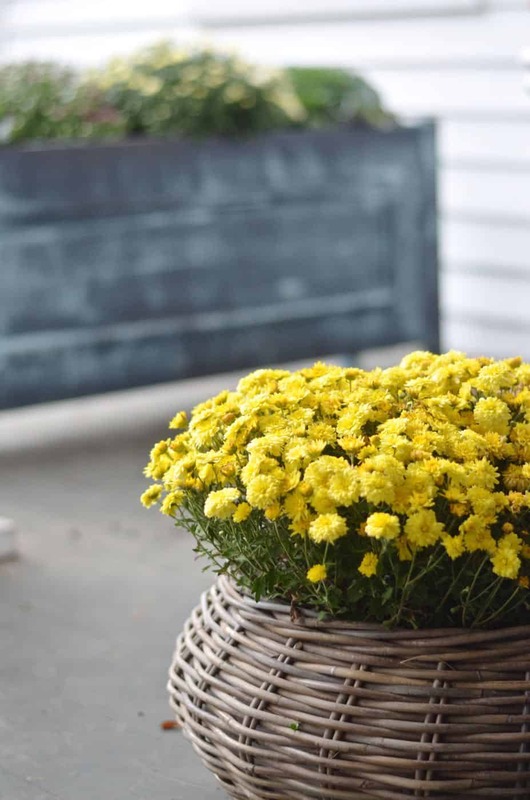 I can line it with heavy plastic and plant them out in the spring, but also just rest these potted plants in them for now to make life easier. 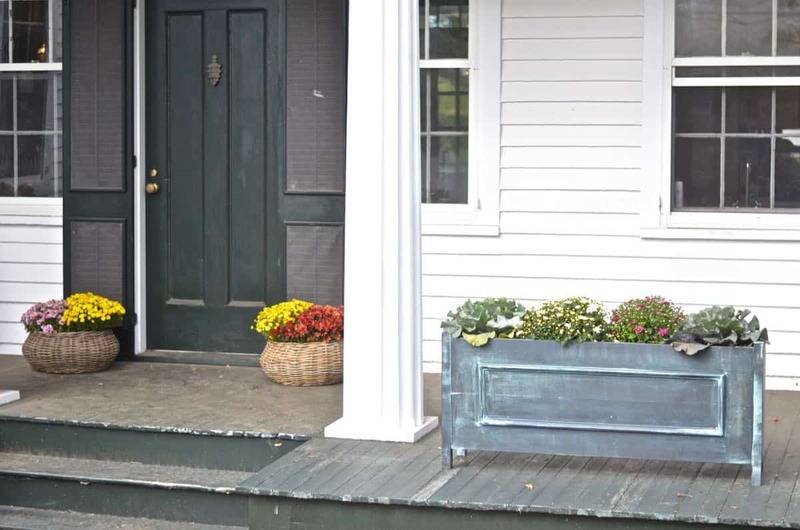 So for today, pull up a seat and enjoy the new and improved decor on our front porch. I have one or two little details in mind to finish the space off, but for now these new ‘metallic’ are in the spotlight? Did I fool you? Did you think they were actually made of metal? Small brass looking finials on the corner posts would really take the planters to another level. Ohhh, so interesting! I love the idea of that. They’d age so nicely, too! Beautiful patina! can you tell me how long they’ve been out in the weather? do they get direct rainfall in their location, or are they sheltered? How is the finish holding up? how is the wood holding up? Thanks!! Hi there! These have been out for a couple of years and they get direct rain/ snow/ sun. Both the wood and the finish are in perfect shape! I was honestly surprised since it’s just the basic common pine!